They say Stephen Harper is fit to be tied, or restrained. 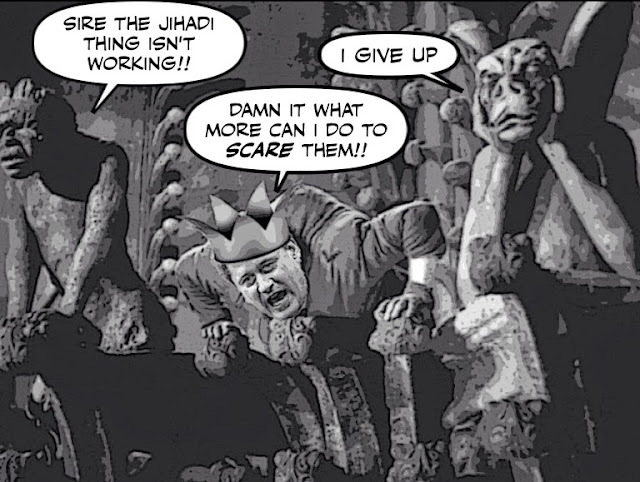 He can't stand the idea that his monstrously flawed anti-terrorism bill C-51 is going to take weeks, rather than a few days to study in committee. 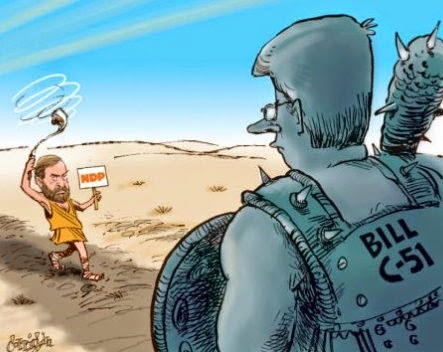 And what must be driving him absolutely crazy is the thought that with every passing day more Canadians are coming forward to call his bill bad and dangerous. 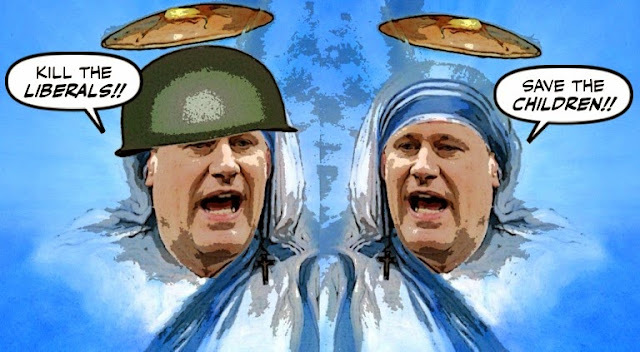 Stephen Harper would like us all to know, that when it comes to the headgear of some Muslim women, some are more equal or permissible than others. Prime Minister Stephen Harper doesn't agree with a Quebec Court judge's controversial decision to refuse to hear a woman's case because she was wearing a hijab, a spokesman says. "If someone is not covering their face, we believe they should be allowed to testify," Harper spokesman Stephen Lecce said in a one-line statement. Even if he doesn't say it himself. And it's just a one-line statement. 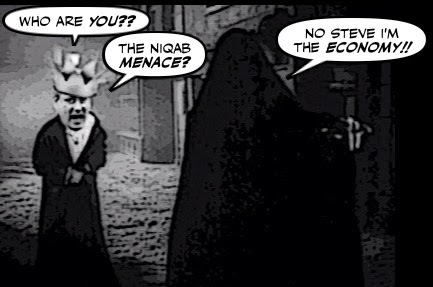 Because of course, as I pointed out yesterday and Chantal Hébert points out today, he's counting on fanning the flames of bigotry in Quebec's Great Niqab debate. Along with his fellow travellers in the Bloc Quebecois. 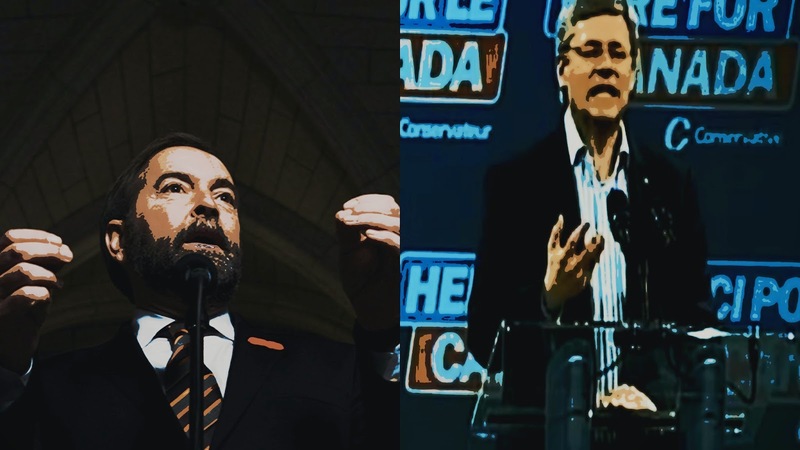 I've always thought it was unfair that Tom Mulcair should work so hard and reap such little benefit. Because the way he grills Stephen Harper in Question Period, like a prosecutor does a criminal, is one of the highlights of my day. Especially since it drives Harper crazy, and makes him say crazy things like what he said yesterday. Even though Mulcair's son is a police officer. So I'm glad to see that all that effort may finally be paying some dividends. 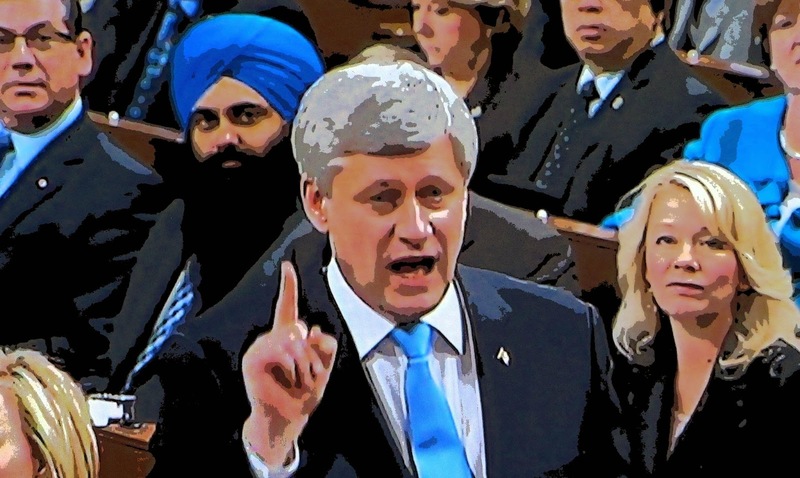 Bill C-51: Is Stephen Harper Feeling the Heat? You could tell by just looking at him that Stephen Harper hated the very idea. He was angry he was vicious. He went after the opposition like a rabid hyena for daring to criticize his flawed and dangerous anti-terrorism bill. He accused the NDP of "attacking the police and the security services." But in the end he folded like cheap suit, and was forced to surrender some ground. 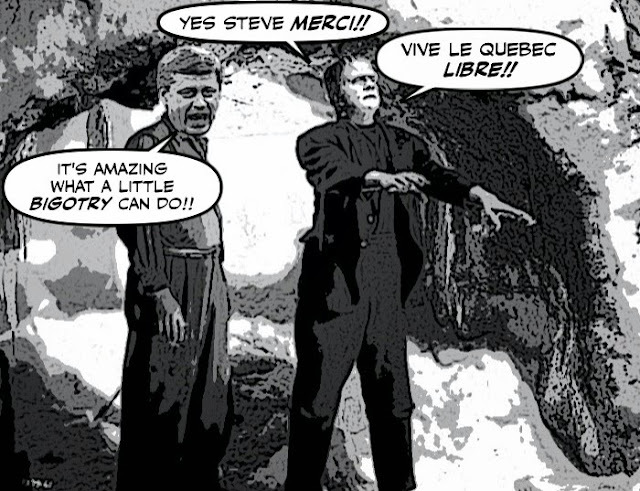 Yesterday I wondered whether Stephen Harper was helping to bring the Bloc Quebecois back from the land of the dead. By fanning the flames of xenophobia and bigotry, and replacing the Great War on Terrorism with the Great War on the Niqab. Which if you read the hideous comments in the newspapers, is what it has become. 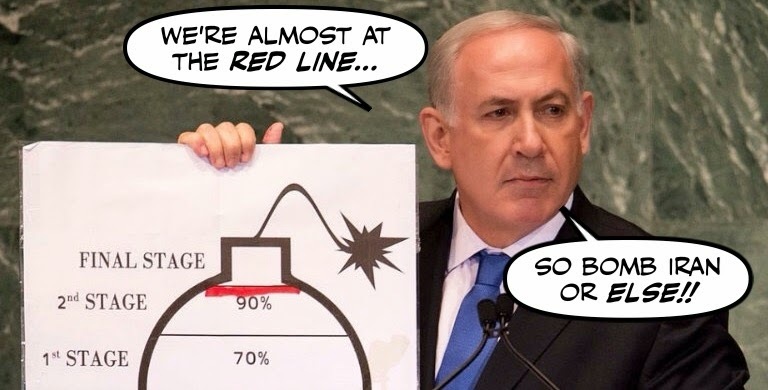 Well I'm sure you remember the day that Benjamin Netanyahu turned up at the United Nations with a crude cartoon bomb to claim that Iran could have a nuclear weapon within months. And I'm sure you also remember how Stephen Harper used that speech to declare Iran a state sponsor of terrorism, and close down our embassy in Tehran. But now it turns out that Benny was stretching or bombing the truth or just lying. 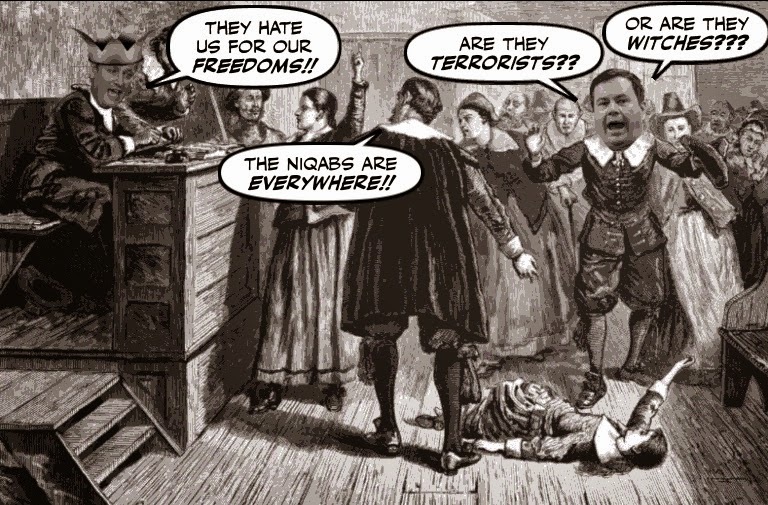 I have absolutely no doubt that when historians look back at this dark period in Canadian history, some will compare the reigning terrorist hysteria to the equally insane hysteria of the Salem witch trials. 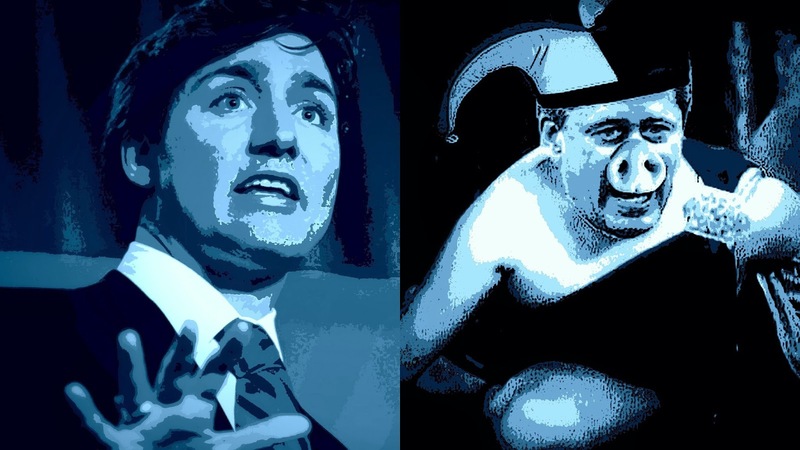 A collective act of temporary madness fomented and encouraged by evil men like Stephen Harper and Jason Kenney, for their own sinister purposes. For it is madness, and it is hysteria, and it is being aided and abetted by the some in the MSM. 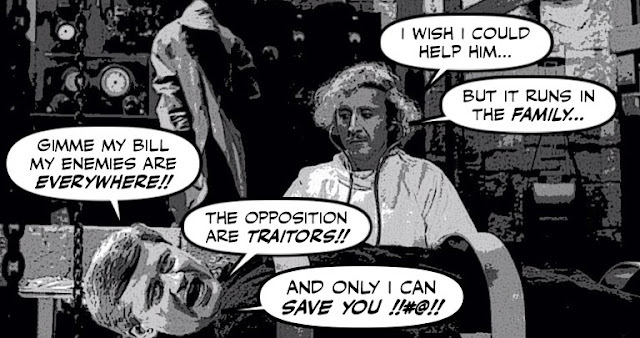 He is using his Great War on Terror to try to scare Canadians into voting for him, even as he turns the country into a police state. He is using fear and bigotry as a blunt weapon against his own people. He couldn't sink any lower. 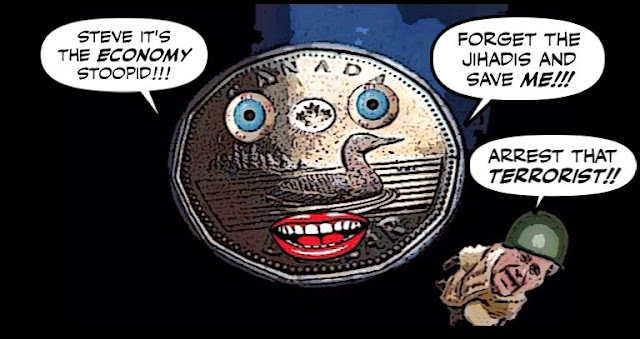 But of course that foul campaign isn't just intended to appeal to the most bestial instincts of Canadians. It's also The Great Distraction. I always knew he was a political thug. I wouldn't have fought him so hard and so long if I didn't think he was the worst Prime Minister this country has ever known. But now of course he is even worse. For as Jeffrey Simpson points out, now he is exploiting personal tragedy and making terror his monstrous mantra. 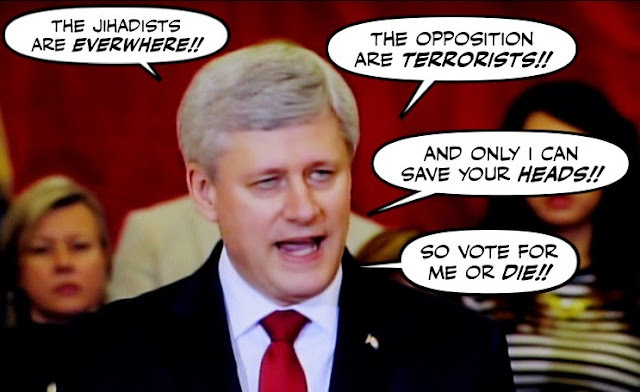 He didn't bother to attend the parliamentary debate on his dangerously flawed anti-terrorist bill C-51. He shut down that debate after only a few hours. And now he's making sure that even the experts won't have a chance to explain why the bill is such a threat. 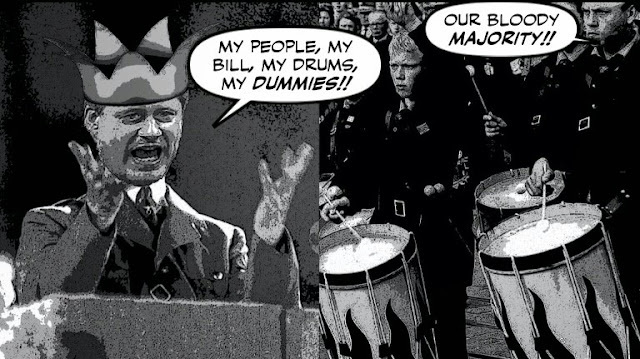 He's rushing his dangerously flawed anti-terrorist bill through the House of Commons, to the machine gun beat of a fascist drum. Bill C-51, the government's proposed anti-terror law, has passed second reading in the House of Commons with a vote of 176-87 and will now be sent to committee. He didn't bother to show up for the debate, he cut it off after a few hours. He says he needs the bill NOW to protect us from the terrorists and the niqabs that are EVERYWHERE. Even though the bill threatens our freedoms more than the terrorists do, and he's just playing politics. Well it was Sunday, so I'm pretty sure Stephen Harper must have thought his feverish prayers had been answered. For there was some masked fanatic on YouTube, apparently on the other side of Africa, calling on wannabe Jihadis to attack the West Edmonton Mall. 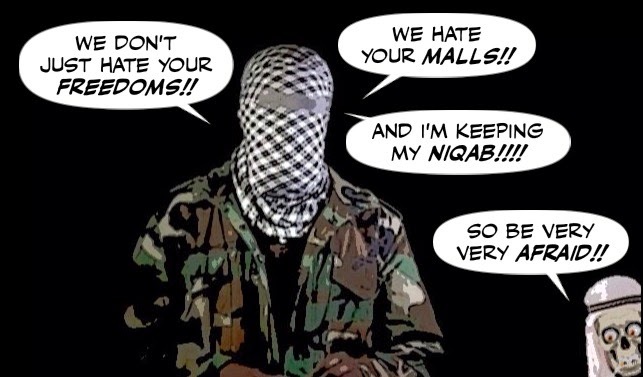 The RCMP says it’s investigating a reported video from the Al-Shabab group that appears to urge Muslims to attack shopping malls in western countries — including the West Edmonton Mall. It's brutally cold out there, again. With the wind chill it could feel like minus 40 tonight. 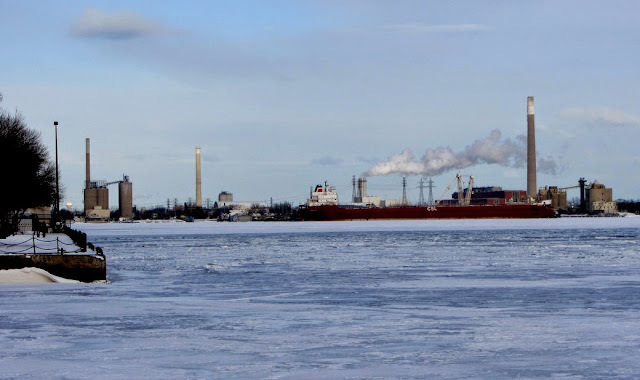 The Great Lakes are almost completely frozen. 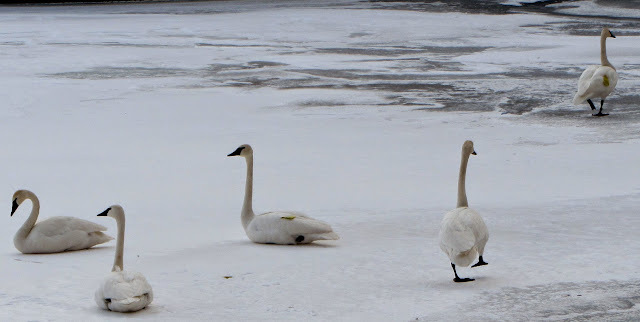 Who like all the other lake birds now have almost no open water in which to find food. Then there's the chill you get when you check out Environment Canada's weather page, and come face to face with the icy horror of Harperland. In his more than nine years in power Stephen Harper has done many foul and disgusting things. 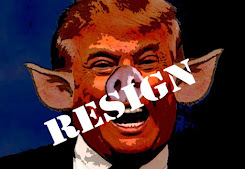 But he has never stooped lower than he has now. And he has never been more dangerous. So I'm glad to see that some in the MSM are finally waking up to what he is trying to do. And criticizing the way he is so blatantly and so shamelessly fanning the flames of ignorance and bigotry. Well let nobody say I didn't warn them. 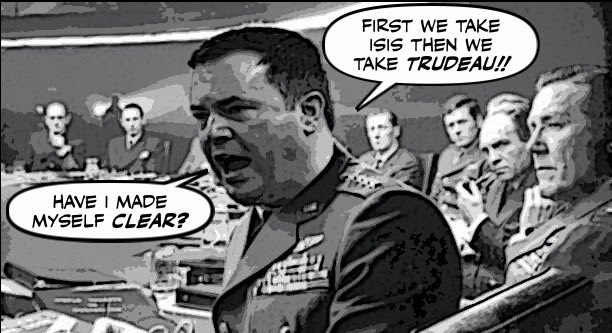 I predicted Jason Kenney would be the worst possible Defence Minister for these troubled times. I knew that sexually repressed religious fanatic would be inflamed by a religious war, and the sight of so many men in uniform. And would soon lose control of himself, start shooting his mouth off, and trying to turn our mini-war in Iraq into an all-out crusade. His icy contempt for Parliament couldn't be more obvious. 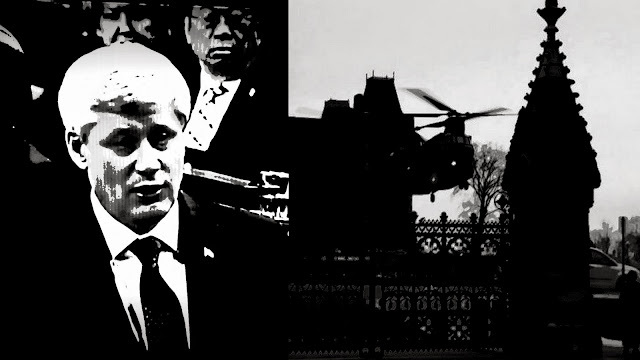 Despite hailing new anti-terror legislation as fundamental to the fight against “the most dangerous enemies our world has ever faced,” Prime Minister Stephen Harper did not attend either of two days of debate on the bill in the House of Commons this week. 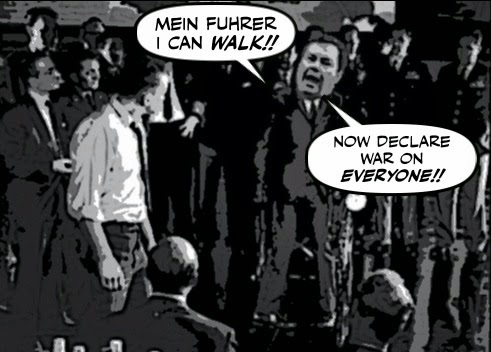 Or maybe he's just confident he's done enough for now to scare Canadians into supporting his fascist bill. No matter how bravely he tries. But what must be driving Stephen Harper crazy or crazier, is that his monstrous march to a another bloody majority, appears to be stalled, or in a deep freeze. 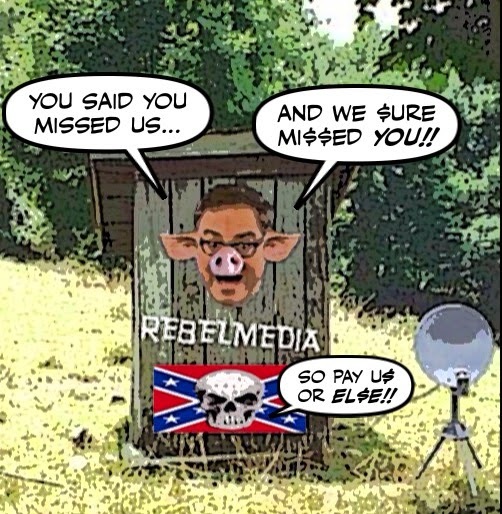 Well you've got to give Ezra Levant credit. It's only been a week since his ghastly TV show, and the entire Sun News Network, went down the toilet. But already he's back on the air again. Or at least living under this rock. As I'm sure you know, Stephen Harper likes to pose as a great friend of children, or a Great Mother Leader. When he's not posing as a Great Warrior Leader. But sadly like so many other Con promises or threats, there's the ugly rhetoric and then there's the ugly reality. It was just a coincidence that the Turner Classic Movie channel should be running Dr Strangelove yesterday. On the same day that Jason Kenney made his first major speech as the Con regime's new Defence Minister. But in a way it seemed strangely appropriate, because I did have trouble distinguishing between the two movies. Or deciding which one was more hilarious or more deeply disturbing. 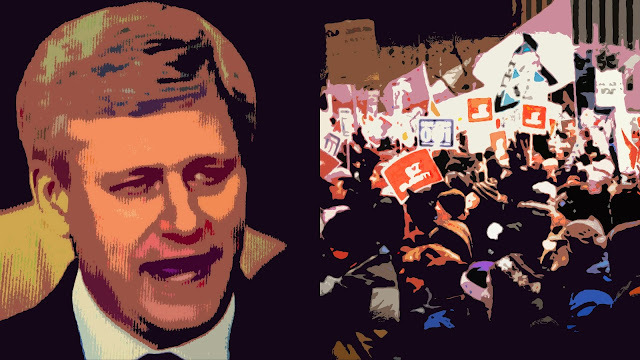 By now it should be obvious that Stephen Harper is not going to allow any changes to his infamous anti-terrorism bill C-51. 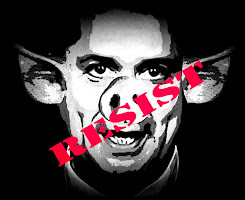 That he is now so crazy and so desperate that he will not let anyone or anything stop him from getting his hands on another weapon to go after his enemies. 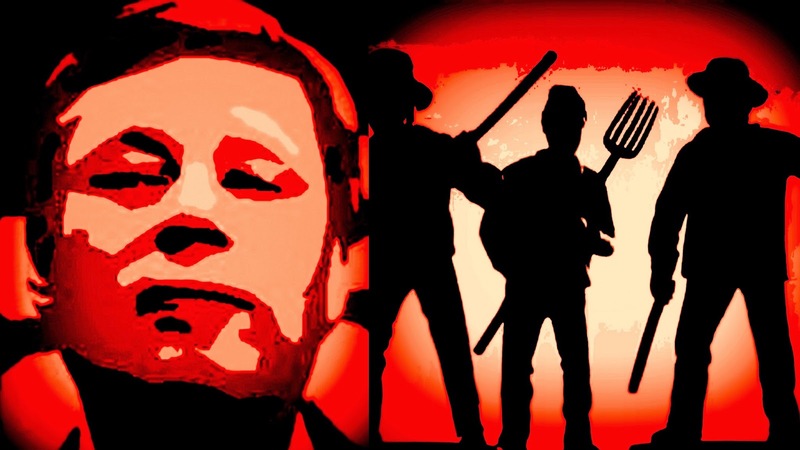 And has finally arrived at the state the first Harper to arrive in Canada was in, when he had to be removed from his magistrate's position for "violent and oppressive measures" vindictive beyond the point of reason. He made that very clear yesterday, when Tom Mulcair asked him why he was lumping legitimate dissent in with terrorist activity? And today he made that even clearer by moving to shutdown debate on the bill. Ralph Nader to Stephen Harper: What's Happening to Canada? 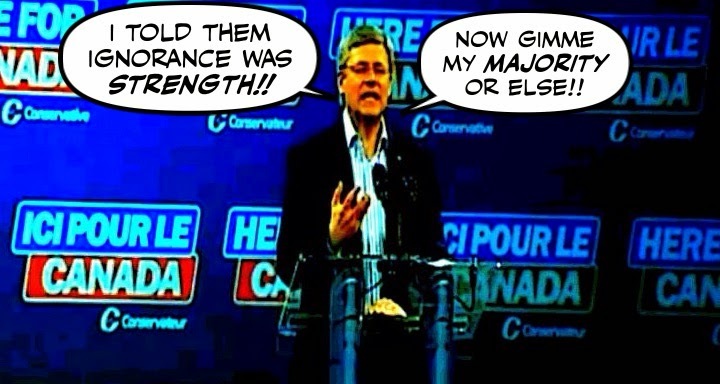 In the monstrous darkness of Harperland, and when I read a poll like this one. There’s rarely been a bill before Parliament that was more popular. The public Conservatives’ new anti-terror legislation is filling a public demand for tough new measures aimed at a terrorism threat that Canadians believe is serious, and close to home, according to a new poll. More than four in five Canadians – 82 per cent – back the new legislation to expand the powers of intelligence agencies and police, according to the survey of 1,509 Canadians conducted by the Angus Reid Institute. Far from seeing it as too sweeping, they tend to want more: 36 per cent say it does not go far enough. I wonder what's happening to my country. And how so many could surrender their freedoms so easily. So I'm glad to see that a person like Ralph Nader is asking the same question in this open letter to Stephen Harper. It was good to see Tom Mulcair finally take a stand against the Con regime's totalitarian anti-terrorism bill. Opposition Leader Tom Mulcair says the NDP will fight the Conservative government's new anti-terrorism bill when it goes before the House on Wednesday and pushed for the Liberals to do the same. 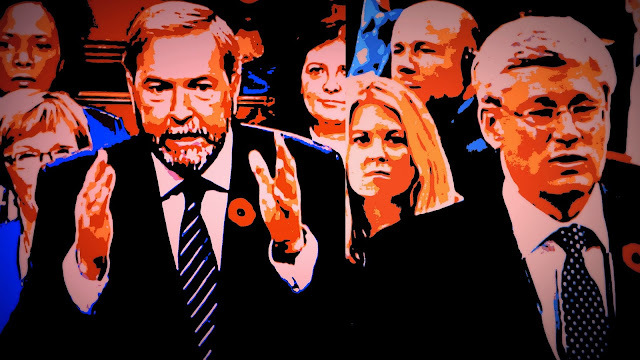 After his party's weekly caucus meeting, Mulcair said the real threat of terrorism requires responsible measures, not the "dangerous, vague, ineffective" Bill C-51. 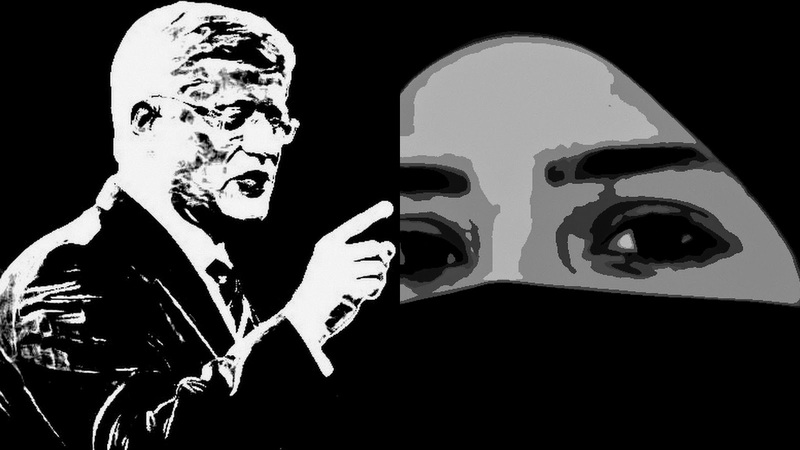 Because it needed to be said: Bill C-51 is a rotten bill and should be scrapped. Well it was a brave attempt, some might say an outrageous attempt, to put a fork in the wheels of justice. 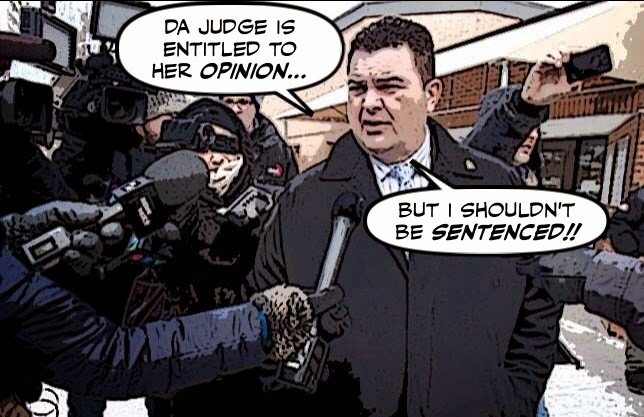 But sadly for Dean Del Mastro it just didn't work, and he will not be getting another trial. It was a chilling moment in Question Period yesterday, that should raise questions about whether Stephen Harper is still mentally fit to govern, and whether we are already living in a police state. The moment when Tom Mulcair asked him whether his totalitarian bill C-51 could be used to spy against his enemies, and he replied by accusing the NDP of being a "black helicopter fleet." Even though it was a very good question, and his sinister black helicopters are already threatening our democracy. 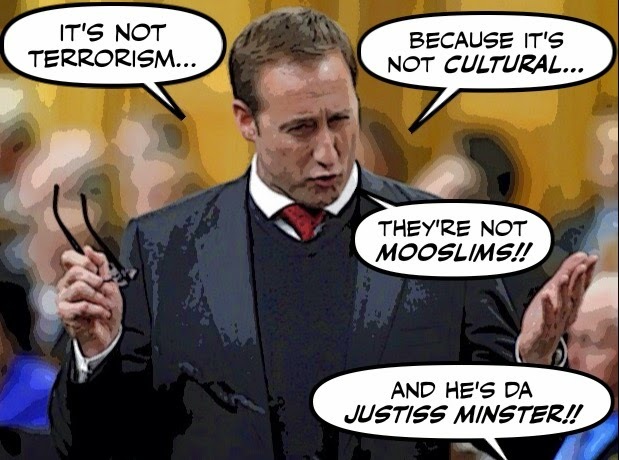 Even by the low standards of Peter Dumbo MacKay, I thought it was bizarre when he claimed that a plot to commit a mass slaughter in Halifax was not linked to terrorism. "What I can tell you is that this appeared to be a group of murderous misfits that were coming here or were living here and prepared to wreak havoc and mayhem on our community," he asserted at a news conference. "The attack does not appear to have been culturally motivated, therefore not linked to terrorism," he said. Especially since the Criminal Code states that terrorism is “politically, religiously or ideologically-motivated,” and makes no mention of cultural motivations. It's not terrorism if it isn't the Muslims, it's just the neo-nazis. 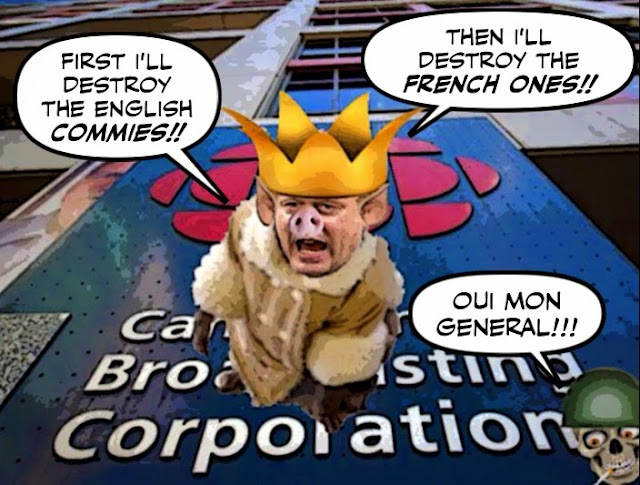 We know how much Stephen Harper hates the CBC. We know how he has slashed its budget, until it's swimming in its own blood. But now he has taken aim at Radio-Canada, and made a huge and possibly fatal mistake. 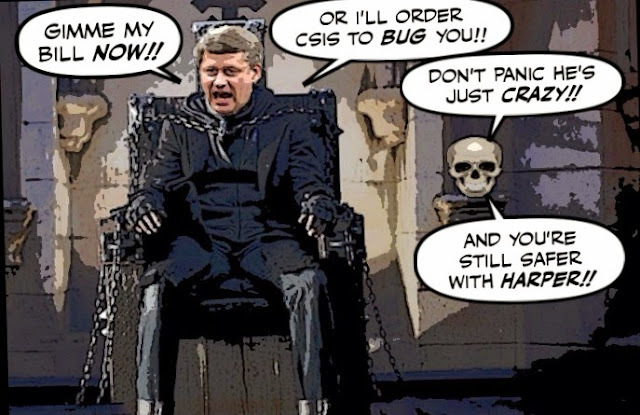 I don't know what is keeping Stephen Harper awake at night these days. But judging from his deathly appearance he isn't getting much sleep. And I bet there are a lot of things on his mind, that keep him tossing and turning in his bed. Or wandering around the grounds of 24 Sussex Drive dressed only in a housecoat. His biggest fear is probably the economy, which is threatening to envelop him like a shroud. But as Michael Harris points out, the biggest monkey on his back is probably still Mike Duffy. 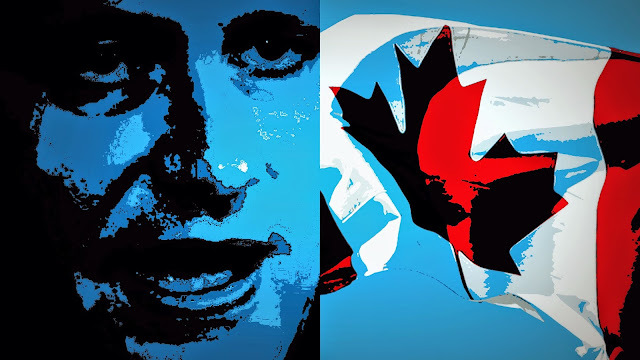 He hates our Canada and its values with a passion, so it follows that Stephen Harper would hate its most powerful and beautiful symbol. He spent almost nothing to celebrate its fiftieth birthday. The federal government has allotted $50,000 for celebrations for the upcoming 50th birthday of the iconic Maple Leaf flag. That's compared to almost $4 million for a campaign marking the 200th anniversary of Sir John A. Macdonald's birth, and $5.2 million spent on the bicentennial of the War of 1812. So this couldn't be more hypocritical. 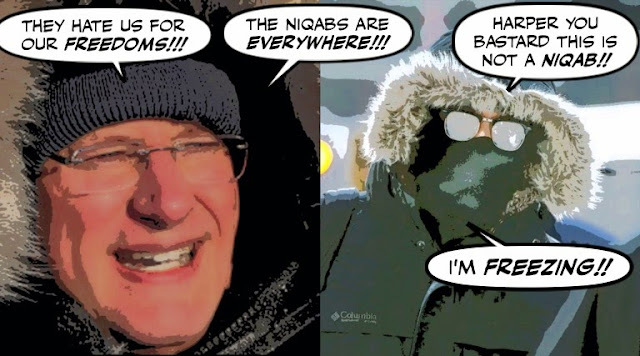 Well I see that Stephen Harper has been spending more time in the tiny Con bastion of Quebec City. 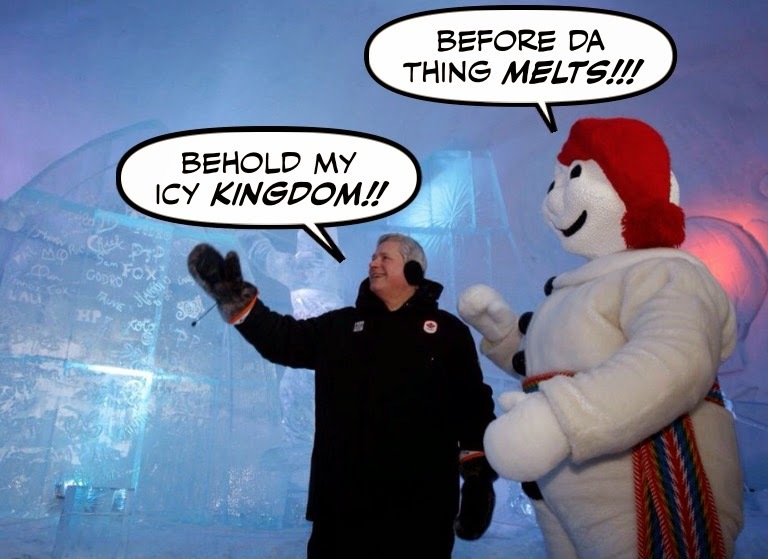 And it seems only appropriate that he should stage this photo-op at the city's Ice Hotel. 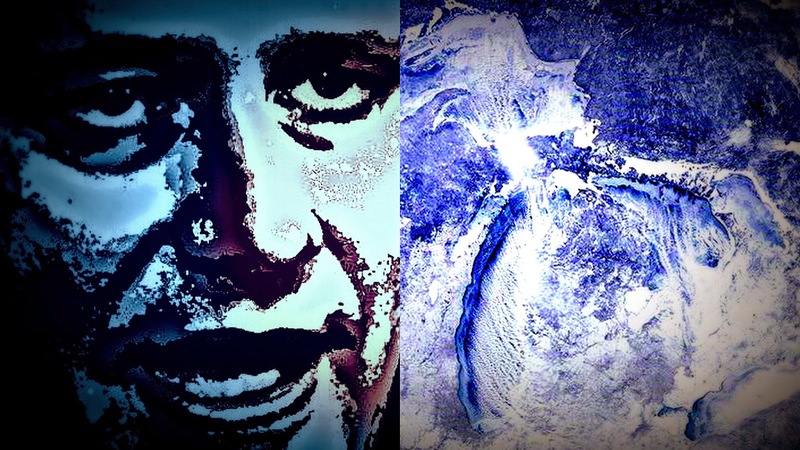 Considering the state of his government, and the way his support is in danger of melting. Well as you can imagine it wasn't easy saying goodbye to the balmy breezes of the Caribbean. After my amazing sailing adventure where I once again showed the sea that I am its MASTER !!! And then returning to the grim reality of Harperland and this arctic nightmare. But I have to admit I almost wish I could have returned sooner, so I could have watched The Sun News Network sink gently plunge suddenly to the bottom of ocean. Or in its case the big blue hole. In my last post I wrote about how Stephen Harper had managed to dumb down Canada by killing the mandatory long-form census. So we're stumbling around in the dark, cities can't make any plans, and we don't even know what diseases are on the rise. But now it appears that the problem is even worse than I thought eh? There are apparently so many dumb people in Canada that Harper might even be able to win another bloody majority. Oh. My. Galileo. 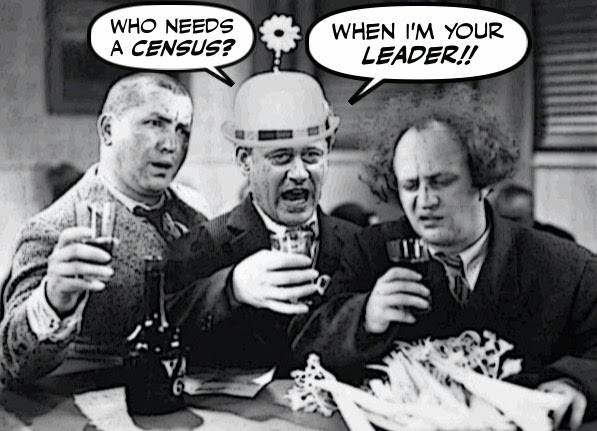 I see that a liberal backbencher's brave attempt to revive the mandatory long-form census, that Stephen Harper killed five years ago, has sadly but predictably failed. Liberal MP Ted Hsu’s drive to resurrect the long-form census has come to an end. His private member’s bill to bring back the long-form census and bolster the independence of the chief statistician was voted down on second reading in the Commons on Wednesday. And for the same reasons Harper gave back then, when he ordered that it be destroyed. 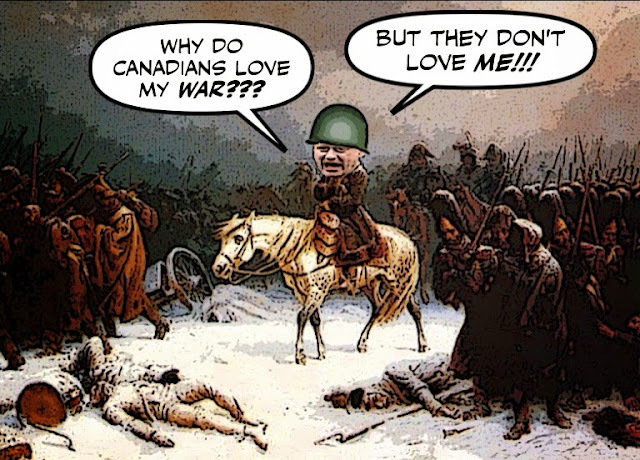 As we all know Stephen Harper is trying to make us believe that we are at war with a giant Jihadi conspiracy. And that only he can save us from those who would behead us in our beds, and Justin Trudeau and Tom Mulcair. Because only he is a Great Warrior Leader. 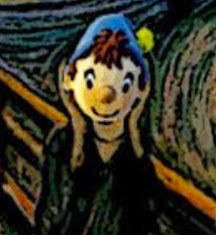 And in pursuit of that absurd illusion he is clearly willing to do or say anything. It's a bitter pill to swallow. Stephen Harper's anti-terrorist Bill C-51 is deeply flawed, threatens our civil liberties and our internet freedom. But if progressives don't want to risk handing Harper another bloody majority what Justin Trudeau said today was the way to play it. Liberal Leader Justin Trudeau says his caucus will vote in favour of a bill to vastly increase the powers of Canada's spy agency — with or without the improved oversight civil rights experts are calling for. Because whatever anyone says, the brutal truth is that any other position at this time could be absolutely fatal. 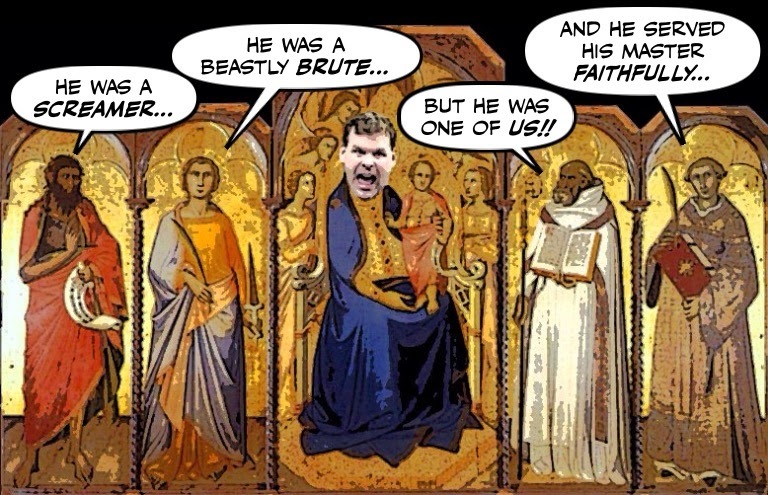 I honestly thought that I would never have to write another word about the Con clown John Baird. And it was such a great feeling. I thought I had said all I needed to say about his shabby political career in this post. But unfortunately I'm going to have to write another post to register my protest at the way the opposition parties fell over themselves praising him yesterday. Or all but canonizing him. Making it sound like he was a saint flawed only by his partisan passion, instead of a political thug. Yesterday I wrote a post suggesting that the opposition forget about Stephen Harper's Great War on Terror, because it's just a distraction. 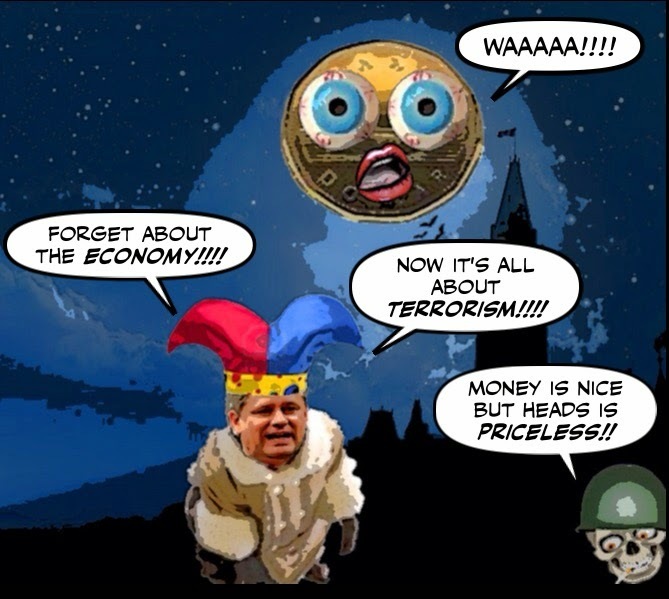 And that they should concentrate instead on his Great War on the Economy, and the tumbling loonie. Because that one is a real threat to many Canadians, and it has the potential to destroy him and his foul Cons. And in that regard this is just more evidence. 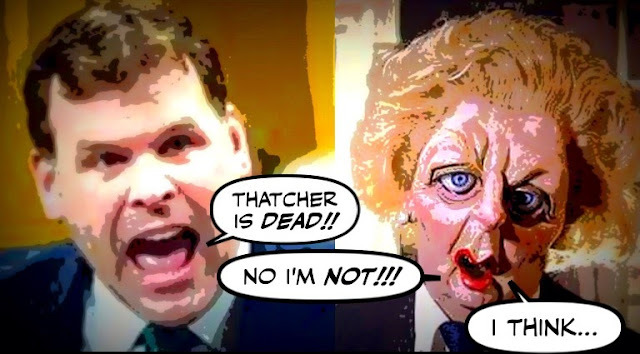 I can never forget the night John Baird tweeted that Thatcher was dead. And how disappointed I was to find out, after consuming half a bottle of very expensive champagne, that it wasn't Margaret Thatcher, it was Thatcher his CAT !#@!!!. But now I just wish I had saved what was left in the bottle to toast Baird's apparently imminent departure. 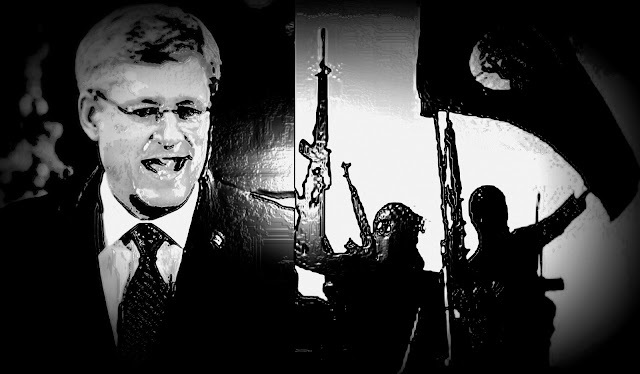 As we all know, Stephen Harper would rather talk about his Great War on the Jihadi Conspiracy. Try to brainwash us into believing that only he can save us from a terrorist attack, even as he does his best to provoke one. But although that is alarming, I'm sure most Canadians are probably more worried about his Great War on the Economy. And what it's done to our poor loonie. Well I'm sure Stephen Harper must have had a tortured weekend, huddled with the monsters in the PMO, and arguing with the screaming voices in his head. 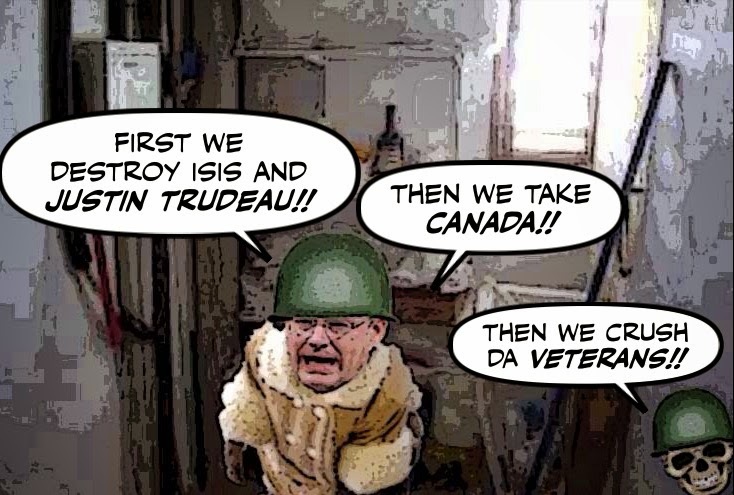 Trying to figure out how to scare Canadians with his Great Jihadi Menace, even more than he already has. So he can herd them into voting for him, and win another bloody majority. 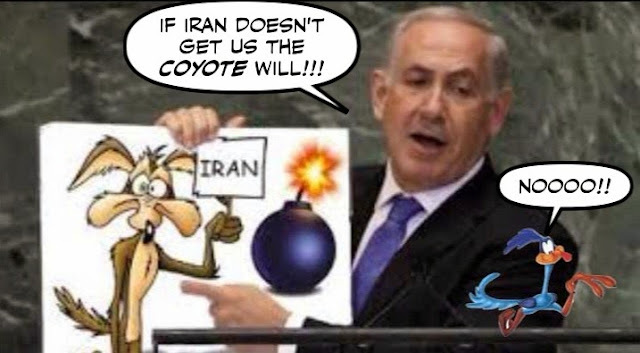 But of course Harper himself is the greatest threat this country faces. His behaviour since his harrowing ordeal in that closet must make many question his sanity. And as Michael Harris writes, he is leading us into the darkness of disaster democracy. 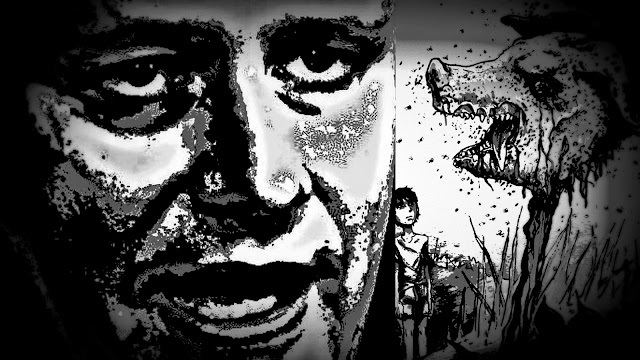 When I see what terrible danger our country is in, caught up in the death-like vortex of the now crazed Stephen Harper. When I read polls like this one. 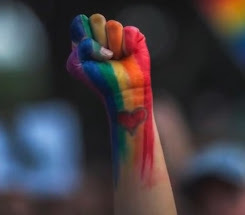 I can't help but think how all of this could be avoided if progressives were united. So I'm glad to see Gerald Caplan urging them to do just that to prevent the unthinkable. Well as we know Stephen Harper chose to deliver his deranged speech on terrorism the other day, at a campaign-style rally in Toronto rather than in Parliament. 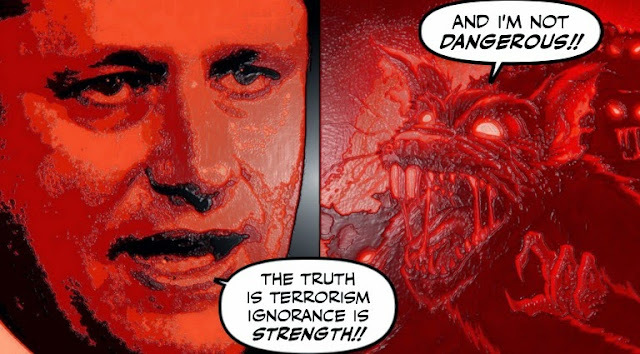 But who knew that while Big Brother Harper ranted and raved about the need for new terror laws, and the need to read our e-mails, back in Ottawa the Parliamentary media were also being terrorized? Locked up, deprived of information, caught up in an Orwellian nightmare. 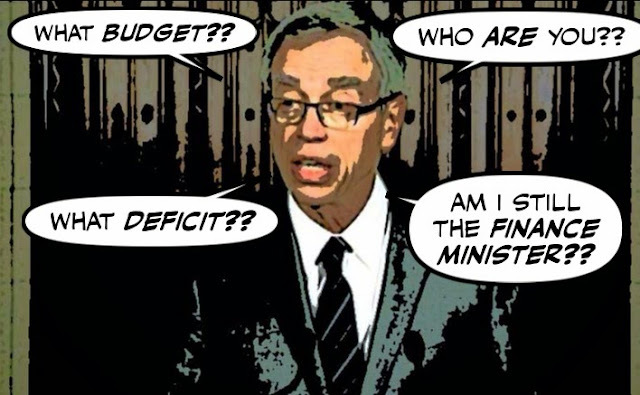 As you probably know, I've got a sinking feeling that Oily Joe Oliver is not going to save us from our present economic predicament. Not when he helped create the oily apocalypse. Not when he doesn't know what he's doing. And is not only a bumbling buffoon, but also a ghastly hypocrite.